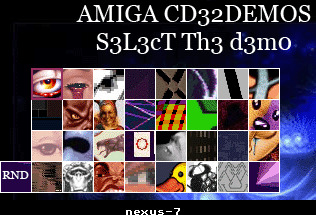 After every Christmas some people make New Years resolutions, and mine is to get an Amiga CD32 because there have been so many releases for the system such as this one by Cobe ' Press Play on Pad : The Demoscene Collection ' that now is the right time to get one. In actual fact with all the games we've been getting this new addition to the library makes the package pretty much complete, especially as it features 32 wicked demoscene productions on a single disc, almost all AGA titles! So turn those speakers up, put the subwoofer to full and get ready as this release is there to give you a bit of a shock, as not only does it contain the mind blowing Nexus-7 by Andromeda, but also other great demo scene productions as well, notably State of the Art by Spaceballs, friday at eight 3, achallamahalla, among the living, arte* , extension , quite unusual, interference, full moon and many others. What's more according to the email we received, the disc will by default play demos in a random order, making it a perfect "virtual jukebox" for the CD32. If there's a specific demo you'd like to watch, all you need to do is (as the title suggests) hold down the "Play" button when the console is booted. What an almost perfect end to 2016 and if this week is anything to go by for the Amiga, we probably haven't seen the last announcement from this part of the scene. Links : 1) Download 2) More Info!